Are annoying little flies testing your patience? Be it at home or the outdoors, flying insects like flies and mosquitoes are always a nuisance, and cause hygiene and sanitation problems. Using harmful and poisonous pest control chemicals or dangerous zappers are definitely not a good option. Especially when there is a highly effective, easy-to-use and 100% safe way to get rid of them! This flying insect swatter is almost too good to believe! To start with, you can conveniently use it indoors as well as outdoors, to get rid of all pesky flying insects with ease. The ergonomic construction ensures that you get a firm grip, while the flexible movement of the mesh surface and long handle are just perfect to swat it around in all possible directions. It is extremely light-weight and therefore very practical for indoor or outdoor use. ▶The kitchen good helper, fast kills the flies. ▶Cute hand shape design, easy to use and more economy. ▶Soft but thick plastic material which makes swatters very durable and sturdy. ▶Large striking area with tight mesh, no bugs or flies can escape. 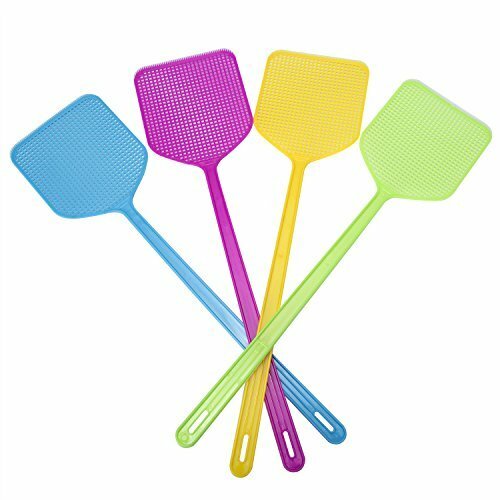 ❤FLEXIBLE: Flexibly constructed so that this flying insect swatter can be maneuvered in any direction conveniently to eliminate all flying insects. The fly swatter is light-weight to enable smooth and swift striking. ❤VIVID COLORS: Striking colors ensure immediate detection of dead insects for quick disposal. ❤ECO-FRIENDLY: Non-toxic and Odorless Plastic made, harmless to your health. ❤FLEXIBLE: Lightweight and easy to use, Holed handle for easy storage. If you have any questions about this product by ZOMOY, contact us by completing and submitting the form below. If you are looking for a specif part number, please include it with your message.